The new iPhone has introduced many new features. One of them is True Tone display. This is an excellent technology which uses device’s front sensors to automatically adjust the white balance of the display to match the background lighting. This lessens the eye strain which you often face when you gaze at your phone’s screen for a long time. Well, not everyone would be comfortable with the True Tone display, as not everybody would be able to adjust to the sudden change in white balance. 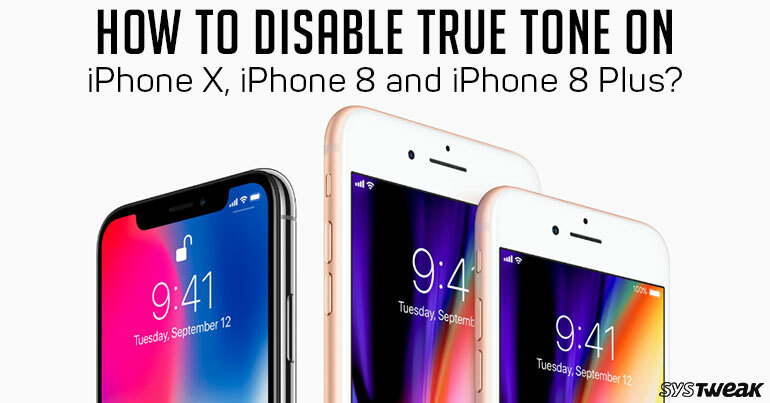 If you think True Tone display is not for you, you can disable it. In this post, we share with you step by step instructions, just have a look! To disable True Tone display, you can use either device settings or you can use new Control Centre using 3D Touch. Follow these steps to disable the feature in a few clicks. Locate True Tone. Now toggle the switch beside True Tone to the left to disable it. Must Read: How to use iPhone 8’s new video formats? If you want to disable the True Tone feature, you can swipe up from the bottom of the screen on your iPhone’s screen to get Control Centre. In case of iPhone X, swipe down from the upper right corner of the screen to get Control Centre. Now locate the brightness slider and do a 3D Touch on it. You will see the option to disable/enable True Tone Display. You can enable or disable with a single tap. Once True Tone is turned off, you will see a slight change in color as the device adjusts to the changes made. As the color shift is very subtle so you might not notice the change. In this way, you can disable the True Tone feature. The feature has so far got mixed reactions as it displays the true tone. Some of the users do not like it as many apps and games do not work at its best with the dynamic change in white balance. On the other hand, it reduces the strain on your eye by adjusting to the background lighting. What do you think? Do you like True Tone Display? Leave your comments below!